Stock sales of cast aluminum blowers, cast aluminum fans, cast aluminum pressure blowers, cast aluminum fan blades, high pressure blowers, centrifugall fan fans, radial blowers, forward curved fans, forward curved blowers, backward curved fans, spark resistant construction fan, power roof fans and wall exhaust ventialtion fans and blowers. Industrial Fan Co. Axial Fans are specially designed and manufactured for optimum ratio between air volume and fan power consumption and to meet the exact demands of commercial and industrial ventilation in hot, humid, dusty and corrosive environments. Cylindrical casing of fans is fabricated out of Mild Steel / Stainless Steel / Aluminum / FRPconstruction material with adequate size for fine clearances as is practicable for better efficiency. Fan impeller will be of cast aluminum alloy and aerofoil ventilator blade is designed to have maximum efficiency at lesser HP. Larger sizes also available on demand. 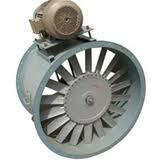 Industrial Fan Co. mancoolers are designed for industrial use where forced draft circulation of air is needed. These blasters discharge high veiocity powerful air offering effective cooling at a particular spot or long distance. Industrial mancoolers are built in robust construction and fitted with TEFC motors for 3 phases, A.C. power supply, and these air blasters employ high efficiency aluminum alloy impellers with aerofoil section blades and are designed for optimum relation between air volume, pressure and power consumption. Air blasters in our range consist of strong wire guards, tilting and swevelling fan arrangments.Their low maintenance and simple handling provide a longer life thus eliminating high operational expenses. Available in standard as well as special sizes.